Thanks for visiting TalkZone. Our goal is to make your listening and viewing experience the best it can be. You can listen LIVE on your desktop or laptop computer if you have Adobe Flash installed. Our live video stream player requires Flash. Click here for Flash troubleshooting if you are having problems with the live player. Don't have Flash? You can also enjoy a LIVE audio stream in Non-Flash formats: Apple IOS, Windows Media, Winamp, Real Player, and Quicktime. Just click the appropriate "Non Flash Media Player" button (upper right, above) to activate the live stream. It may take up to 20 seconds for the live stream audio to start playing. 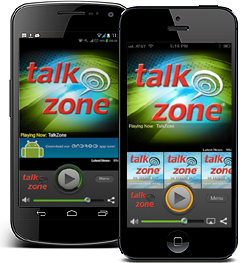 Your best listening experience is with the FREE TalkZone apps for ANDROID, APPLE IOS or AMAZON devices. They're fast, easy to use and highly recommended. You can also find TalkZone shows at Tune In.